I love creamy sauces like alfredo or carbonara but I don't like how heavy it is with regular pasta. When I have a thick and creamy sauce I like to use my favorite pasta substitute the zoodle. 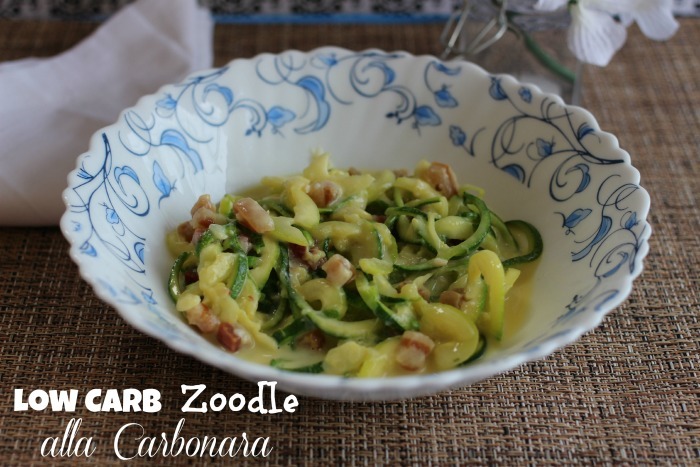 Since all of the ingredients to make the carbonara sauce is low carb I decided to make it with my zoodles. Carbonara is a creamy sauce made from eggs and cheese with the addition of bacon or pancetta. It is one of my favorite "pasta" dishes because it is super easy to do. Since you don't have to boil the zoodles it is also quick and a one pan meal. 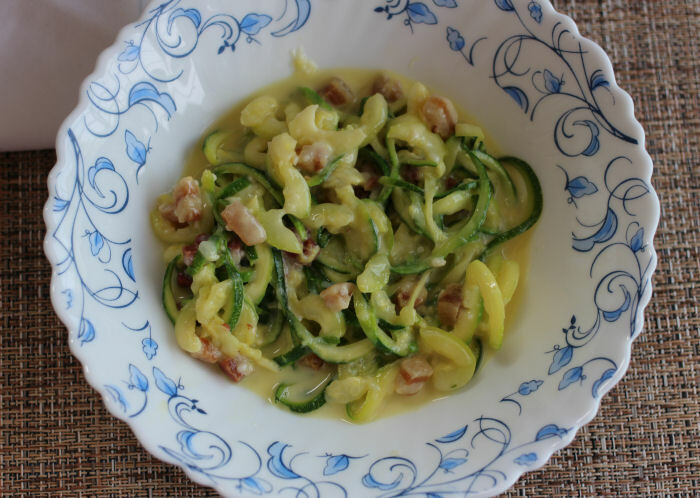 All you have to do is cook some pancetta and then add your zoodles. Mix some eggs and cheese and drizzle into the zoodles and pancetta. It's amazing how creamy the combination of eggs and cheese make this dish. Clean the zucchini really well and slice off the top and bottom. 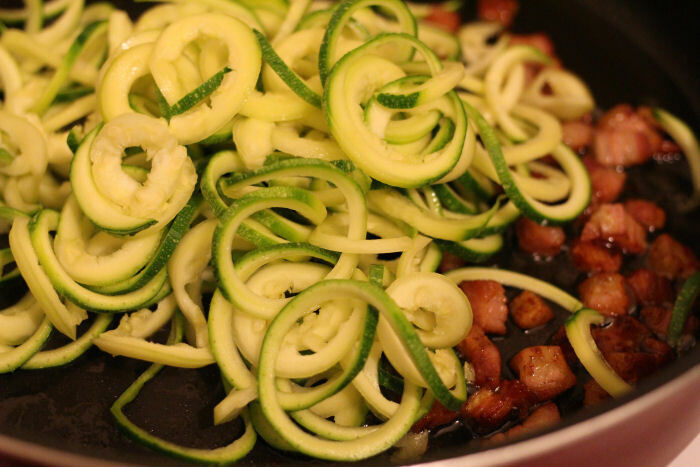 Use a spiralizer to cut your zucchini into zoodles. Set aside. Place olive oil and pancetta into a large pan on medium heat. Cook pancetta until it gets golden and crispy. Add garlic and stir frequently so the garlic doesn't burn. While pancetta is cooking whisk eggs and then add Parmesan and mix well. Set aside. Add the zucchini to the pancetta and cook stirring for a minute. Boil 1/4 cup of water and let cool for a couple of minutes. Slowly add to the eggs that have been whisked to temper the eggs. Whisk in the cheese. Remove pan from heat and drizzle in the egg and parmesan mixture while mixing. Mix really well so that the sauce covers the zoodles completely. Cover pan and let stand for about five minutes. Found this from your IG...I would like to try this recipe tomorrow. Thank you. We LOVE zoodles in our house! They are so good! 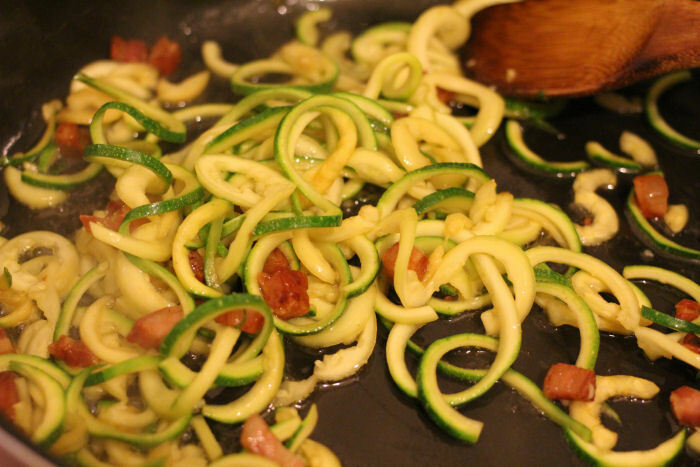 I have never heard of zoodles, but it looks like a tasty way to make food! My kiddo might like the shape and eat more of it! Thanks for sharing! Zoodles are a favorite! This dish looks delicious! I have heard so many great things about zoodles lately. I heard that KitchenAid was even coming out with a zoodles attachment, in addition to the pasta attachment they already have. Such exciting advancements in how we eat healthy. I love me some carbonara, this looks great! I need more zoodles in my life. Of this I am certain. Those are adorable, and the carbonara looks amazing. I have fallen in love with zoodles. I'm always looking for new recipes. This one is perfect!! That is my kinda dinner! I want a bowl right now!